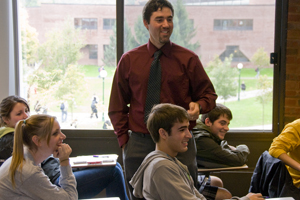 The major in Social Studies provides students with a strong foundation in teaching secondary Social Studies, enabling them to implement state and national educational standards. Demonstrate a broad store of knowledge of history, geography, economics, politics, and related social sciences. Describe, analyze and explain economic, political, cultural, social and physical systems in the context of time and space. Demonstrate the ability to conduct and present both orally and in writing quality research so as to participate actively in-and foster-the ongoing construction of knowledge. Apply knowledge of Social Studies creatively, and demonstrate a love of learning and a critical awareness of the significance of Social Studies for human well-being. The electives must be chosen from History, Geography, Economics, Political Science, Environmental Studies, and/or Global Studies. No more than 9 credits in one discipline.